In the months leading up to Osama bin Laden’s death, a survey of Muslim publics around the world found little support for the al Qaeda leader. Among the six predominantly Muslim nations recently surveyed by the Pew Research Center’s Global Attitudes Project, bin Laden received his highest level of support among Muslims in the Palestinian territories – although even there only 34% said they had confidence in the terrorist leader to do the right thing in world affairs. Minorities of Muslims in Indonesia (26%), Egypt (22%) and Jordan (13%) expressed confidence in bin Laden, while he has almost no support among Turkish (3%) or Lebanese Muslims (1%). 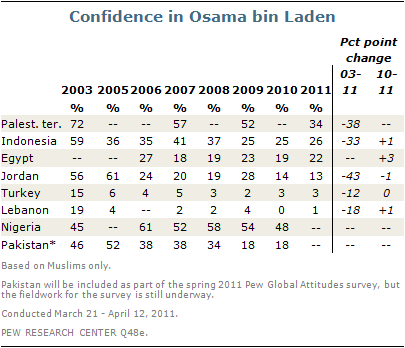 Over time, support for bin Laden has dropped sharply among Muslim publics. Since 2003, the percentage of Muslims voicing confidence in him has declined by 38 points in the Palestinian territories and 33 points in Indonesia. The greatest decline has occurred in Jordan, where 56% of Muslims had confidence in bin Laden in 2003, compared with just 13% in the current poll. Jordanian support for bin Laden fell dramatically (to 24% from 61% the year before) in 2006, following suicide attacks in Amman by al Qaeda. In Pakistan, where 2011 data is still not available, confidence in bin Laden fell from 52% in 2005 to just 18% in last year’s survey. Al Qaeda also received largely negative ratings among Muslim publics in the 2011 survey. Only 2% of Muslims in Lebanon and 5% in Turkey expressed favorable views of al Qaeda. In Jordan, 15% had a positive opinion of al Qaeda, while about one-in-five in Indonesia (22%) and Egypt (21%) shared this view. Palestinian Muslims offered somewhat more positive opinions (28% favorable), but about two-thirds (68%) viewed bin Laden’s organization unfavorably. Ratings of al Qaeda are, for the most part, unchanged, except in Jordan, where al Qaeda’s favorable rating fell from 34% in 2010 to 15% currently. As was the case with views of bin Laden, Nigerian Muslims typically offer more positive views of al Qaeda than any other Muslim public surveyed.